It has just occurred to me that I didn’t finish off sharing my 2015(!) Disney Trip Report – Halloween in the Wilderness with you. So I thought I best catch up, and put this one to bed – especially since I want to get writing on my 2016 trip report! It feels rather fitting that I’m writing the final day of my Halloween in the Wilderness 2015 Disney Trip Report exactly a year to the day that we left Orlando to come home to the UK! You might think that I did that on purpose, but I can assure you that I didn’t – I’m glad it worked out this way. This trip report has taken me so long to write. I have really struggled with it – time management has been the biggest factor, as once I get started writing, I’m okay. I’ve got a new report to start writing soon, and I sure hope it doesn’t take me as long! Back to day 17… After making final checks around our room to make sure that there wasn’t anything left behind. The last day of a holiday is always tinged with sadness – I’m not going to lie, I cried! But all good things come to an end, including awesome holidays to Walt Disney World. We loved staying at Wilderness Lodge, it was such a homely resort, and we hope to come back here one day. When you stay at a Disney resort, you can enjoy your final day before you have to fly/travel home without having to worry about your luggage. Everything can be safely left with Bell Services, and you just pick it up when you need to. This is a free service, but we always tip, usually a dollar per item. So we left our suitcases, and headed over to Magic Kingdom for a few final hours of Disney Magic, and lunch at Tony’s Town Square Restaurant. When I originally booked this holiday, I had hoped we would be able to catch both Mickey’s Not-So-Scary Halloween Party and Mickey’s Very Merry Christmas Party. Sadly, my calculations were off by one day, and the latter was not meant to be. However, Christmas decorations had appeared at Magic Kingdom, and it was so cool to see the park decked out for the season. We have only ever seen it “bare” and for Halloween on past vacations, so this was a lovely treat. The tree is the biggest change you’ll notice as soon as you walk into the park. It obscures the view of Cinderella Castle though – boo! The tree was decorated with popcorn garlands, brightly coloured ornaments, candy canes, candles, and gingerbread men (and horses, boots, and trees!) it was a cute tree, but I actually preferred the tree that was up at Disneyland Park in Paris (which we visited on Christmas Day of 2015!) There was a Disney PhotoPass Photographer, but there was a longish line, and we didn’t have time to waste on this final day. Whilst it was awesome to see all the decorations, I’d rather have the whole Christmas time experience, and not a few hours. Other Christmas decor were garlands, wreaths, smaller Christmas trees, poinsettias, toy soldiers, giant candy canes, silver bells, and of course, Mickey shaped decorations! The area next to City Hall had turned into the Candy Cane Garden, where you can have a photo taken with a character – I’m sure there was a Disney Princess there on this visit, but my understanding is that you can also meet Santa Claus here too. Christmas merchandise had already been appearing in the stores, but this was the first time we’d seen the Emporium decked out for Christmas time. They have great Halloween merch displays, so Christmas was no different. I can’t remember now if we actually bought anything, or if we had done all our Christmas merch buying previously. 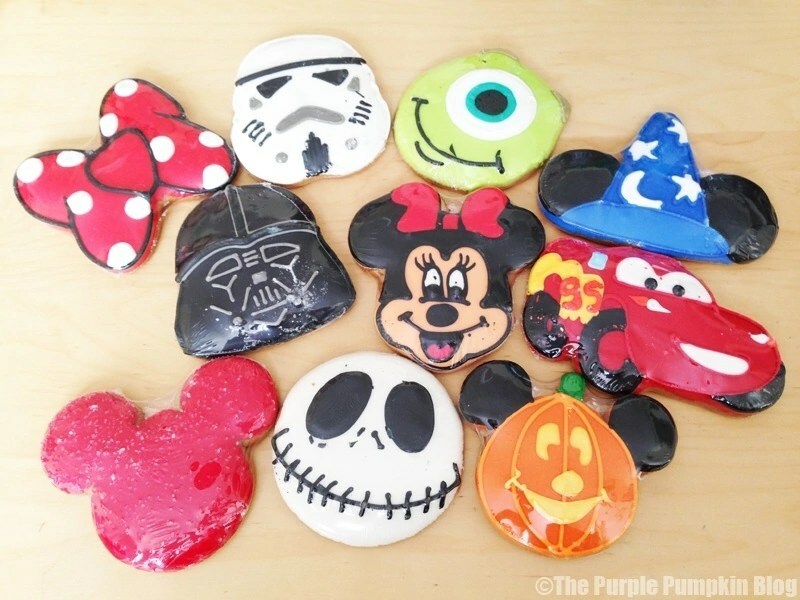 What I do know though, is that we spent the remaining meal credits (you can use 1 meal credit for 3 snacks) and snack credits from our Deluxe Disney Dining Plan on lots and lots and lots of snacks – mainly character cookies and rice krispie treats! I don’t have any photos of them I’m afraid – I brought them home, and then started dishing them out to family and friends! However, I have got an older photo which I’ve included below. We didn’t buy the giant Mickey Mouse treat – not available as a snack credit!! !